A pleasant, if rather hidden away, pub just off Pall Mall in St James's. 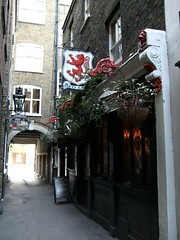 Not to be confused with The Red Lion on nearby Duke of York Street (another fine, if small, local pub). The small downstairs room can get crowded after work and at busy times, but it doesn't feel too cramped and the service at the tiny bar is very friendly. However, even at busy times, there's often space to sit in the upstairs lounge room, which is on the way to the ladies' toilets (on the second floor). On nice days, drinking often spills out into Crown Passage. There are two ales on the bar (Tribute and one other on Ewan's May 2010 visit, and not often changing), as well as a few typical lagers. What the pub lacks in range of drinks it more than makes up for in a pleasant environment, easily accessible to the West End and St James's Park. Accessibility: Gents are down an extremely narrow and windy staircase, while ladies' toilets are on the second floor (the staircase there is a little less perilous). Last visited by Ewan, and friends, May 2012. Last edited 2013-05-10 07:55:11 (version 5; diff). List all versions. Page last edited 2013-05-10 07:55:11 (version 5).